Terus belajar dan belajar dari kehidupan: Sarapan dengan protein : cukup kenyang ke? Sarapan orang Malaysia memang sedap dan mewah. Alhamdulillah dengan kepelbagaian bangsa, kita boleh makan macam-macam waktu pagi. Belum kira lagi waktu lunch, dinner, minum petang, supper. Food heaven! Tapi bagi mereka yang health conscious mesti titik beratkan apa yang dimakan sehari-hari. Berdiet bukan bermaksud kena korbankan makan, tapi pilih makan secara bijak. Ni aku share article tentang High Protein Breakfast. A high protein breakfast can give you the perfect start to your day. Protein can be a great way to fuel up after a long night's rest. Here are some reasons why you should enjoy a breakfast that is high in protein and some recipe ideas to get you started. Protein is a building block of cells throughout the body. It is necessary for healthy skin, nails, muscles, cartilage and blood. Protein helps to build and repair bodily tissues, and it is used to produce hormones and enzymes. When you eat protein for breakfast, you will feel more energized and ready to take on your day. You are also more likely to feel full longer, which can lead to healthier eating habits and possibly even weight loss. Protein shakes or smoothies are very easy to make. Blend together a cup of strawberries, a few slices of banana, a scoop of protein powder, some ice and a cup of milk. Of course, you can adjust the ingredients to fit your tastes. Make your shake or smoothie with pineapples, orange juice, blackberries, blueberries, yogurt or whatever you have in your refrigerator. You can also add flaxseed for the added omega 3 fatty acids as well as fiber. Top it with some granola for an additional crunch. Be creative and enjoy the many ways you can get your protein for the day. Eggs have gotten a bad reputation because of their fat content. Only a portion of their fat comes from saturated fat and studies show that eggs may actually help lower cholesterol, as opposed to raising it as previously believed. If you aren't entirely convinced, enjoy only the whites or mix one whole egg and one egg white. Eggs are a good source of choline, which is essential for a healthy brain and nervous system. Choline also reduces inflammation among those with heart disease, diabetes or osteoporosis. Eggs have carotenoids that are essential for healthy eyes. Lutein, a carotenoid that is found in eggs, is believed to significantly reduce the risk of macular degeneration and cataracts. Scramble some eggs for your breakfast or make a tasty omelet with your favorite vegetables. Eggs are a great source of protein, so don't be afraid to add them to your menu. Nuts and seeds are a great source of protein. They are also rich in fiber and antioxidants. Sprinkle some flaxseed or almonds on your oatmeal. Add pumpkin seeds or pecans to your cereal or yogurt. Avoid nuts if you have an allergy to them. If you are a vegetarian, you may be looking for ways to meet your protein needs. Soy is a plant-based protein that has been popping up as an ingredient in more and more products. Look in the frozen food section at the meatless meats. Here you will find soy-based products that have similar tastes and textures to meats. You'll find breakfast sandwiches and sausages that will allow you to get the protein you need without eating animal products. You can also turn to soy milk, soy nuts and soy butter to get protein. Mencari sarapan berprotein tinggi dan mudah disediakan setiap hari? Cuba gabungan Energized Soy Protein (ESP) dan Meal Shakes. Setiap canister boleh tahan dalam 1.5 hingga 2 bulan. Nak lagi best? Top up dengan Performance perisa oren, yang memastikan badan terhidrat sepanjang hari. 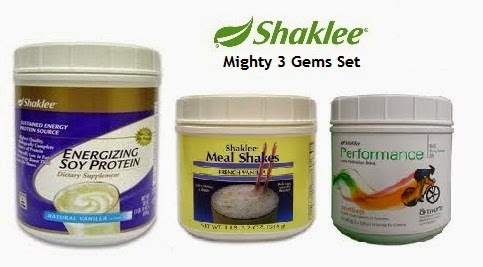 Jadi ahli Shaklee untuk dapat harga lebih murah dan pelbagai manfaat lain. Contact Ima untuk tempahan dan pembelian.